Not so long ago, professional gamers needed to rely on expensive office chairs to get them through the day and have a comfortable gaming experience. These days, the situation is almost completely the opposite. Businesspeople and those who spend a lot of time at work sitting behind a desk are reaching out to the gaming world for help. 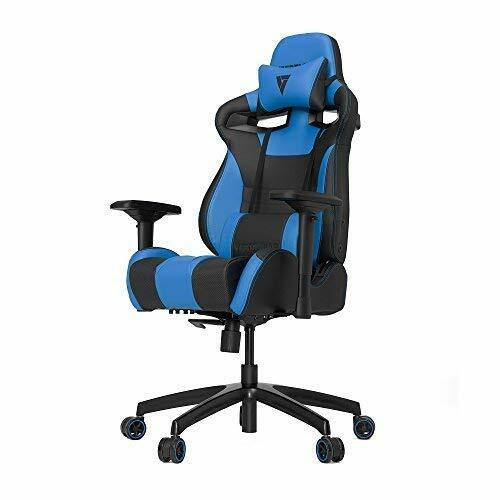 Nowadays, you can buy really amazing gaming chairs which can be used for other purposes, as well. Since they are designed to provide comfort over longer periods of time, you could benefit from them, too. Let’s take a look at one of the best-selling chairs on the market, the SL4000 from Vertagear. The SL4000 is the middle-of-the-road gaming chair from Vertagear’s line of products known as the S-Line or the Racing series. It is a gaming chair designed to provide you with plenty of comfort for those multiple-hour gaming sessions. It does look a little bit like a seat from a race car and it sure does grab your attention the very moment you lay your eyes on it. Well, of course it is aimed at passionate gamers who like to spend whole days playing video games, and as such they might come off as a bit childish, especially if you take into consideration the whole racecar-inspired visual appeal. If you look a little closer though, you will notice that the chair is meant to provide massive amounts of comfort and that it has plenty of adjustability options, so it may come in handy for those whose work involves sitting around all day long. Be it an office space or the comfort of your own home, you will feel much more focused on your work. Included in the packaging you will find the disassembled seat and some Allen keys for assembly. Compared to some premium office chairs, this may come as a bit of a letdown, since they mostly come fully assembled. On the other hand, the SL4000 features the so-called “Slide-in” design so it is really easy to assemble, and it will only take a few minutes before you can take it for the first test drive. The Allen keys will be required just for the assembly of some smaller parts, such as the wheels. Starting from the bottom, the SL4000 comes with a five-spoke base made out of aluminum, while the frame is made of steel. Combined with a Class 4 gas lift, it really makes for a sturdy and stable chair, while at the same time it doesn’t weigh that much. The chair is covered in PVC leather that is water-resistant and easy to maintain. There are several different color options to choose from. Underneath the leather, you will be greeted by dense foam and a breathable structure which will keep the heat levels rather low. Now, let’s get down to the numerous adjustment options. Of course, the seat can be adjusted for height, just like most office/gaming chairs. The armrest can be adjusted in four different directions, which is excellent at reducing fatigue and muscle strain. The backrest is also fully adjustable independently from the other parts of the chair. The angle of the backrest can be adjusted up to 170 degrees. Turning the knob on the tilt mechanism will make it very easy to decrease or increase the tilt tension, but either way you should adjust it according to your body weight. This adjustment comes in very handy when you want to lean back or rock on the chair without straining your muscles excessively. On top of all this, the chair comes with a cushion for additional lumbar support. Besides this one, there is another support cushion designed for your neck area. As is the case with pricey gaming chairs, you should take a few days and play with all the adjustments available. It is not meant to provide you with the comfiest sitting experience right out of the box. Fiddle with it and work out the best combo that suits your body and your posture and by doing so you will definitely get the most out of it. If you like the idea of a super-comfortable office chair, but you can’t really stand the buckle seat design, maybe you should check out something else that is a little less dramatic. At this price range, we strongly recommend you try out the Leap chair from Steelcase. It will also give you plenty of options and adjustments, minus the racing car appearance. All things considered, the Vertagear SL4000 is a rather fine chair. It will provide you with heaps of comfort for prolonged periods of time, and it will conform to your body and your posture, once you get a hold of all the adjustment options. The only issue we might have here is that it looks a little childish with the racecar seat design.